Some of America's brightest children will visit the White House as President Barack Obama holds his final science fair to highlight work that excelled in a broad range of competitions. 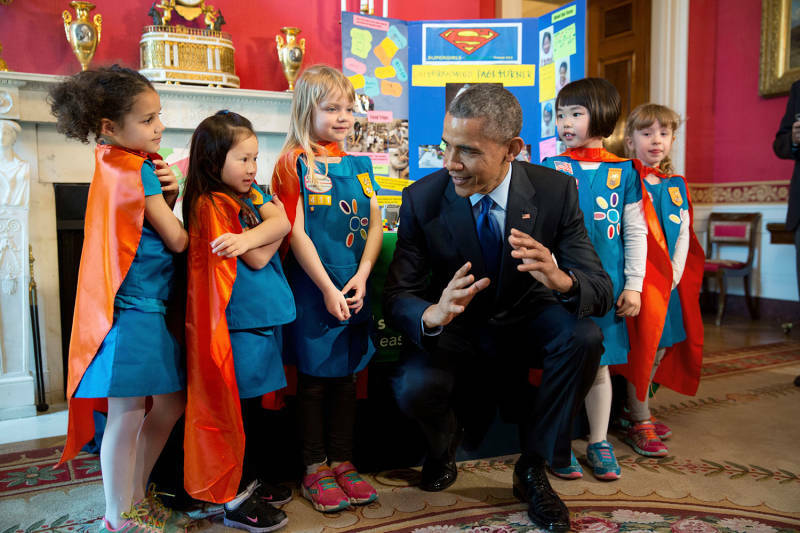 Obama began the science fair in 2010, saying the students who produce the best experiments and products ought to be recognized like the athletes who regularly come to the White House. “If you win the NCAA championship, you come to the White House," Obama said in 2009. Maya Varma of San Jose used 3D printing to develop a cost-effective device to analyze lung health and accurately diagnose lung disease. Shaneel Narayan and Jahsene Tongco of Union City built a solar-powered charging station for electric vehicles. A group of teen programmers from San Diego created Spectrum, an Android app that aims to provide a social-media network for the LGBTQIA+ community. A Los Angeles robotics team was selected as the best role model in transforming its community by spreading interest in science and technology. Talie Cloud from Sanger created an organic agricultural insecticide from bitter melon seed. Hari Bhimaraju from Cupertino used a Raspberry Pi and Arduino to design a portable teaching tool to help visually impaired students learn the periodic table of elements.